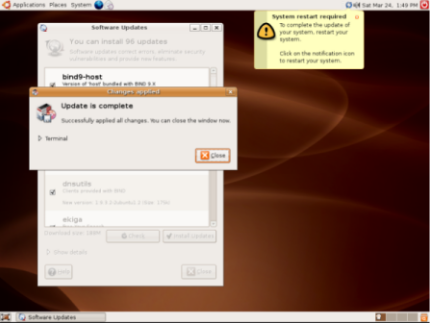 After considering the updates available for Ubuntu, click on "Install Updates". A new window will be launched. 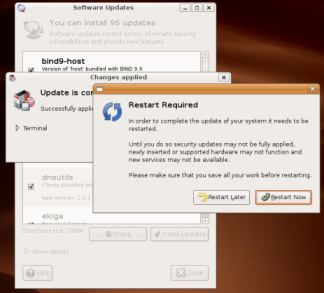 In it, you can see the progress of the downloading, installing, and configuring of the updated software. If you click on the arrow next to "Show progress of single files", you will be able to see even more detail. A helpful download rate is also given to indicate how fast the downloads are occurring and how long the update is expected to take. When the update process has finished, you will see the following screen. As this is the first time that updates have been downloaded andinstalled, it is likely that restarting the system will be required. You will see the notification in the upper right of the screen. Clickon the circle of blue arrows to bring up a dialogue box. If you come from the Windows world of download, install, restart, configure (repeat as necessary), you should know that Ubuntu restarts for the sake of updates very rarely (usually only when system-critical components are updated). You can push on with the present installation if you want by choosing "Restart Later". If you would rather get the restart over with, choose "Restart Now". Now, you can configure the computer to your liking.